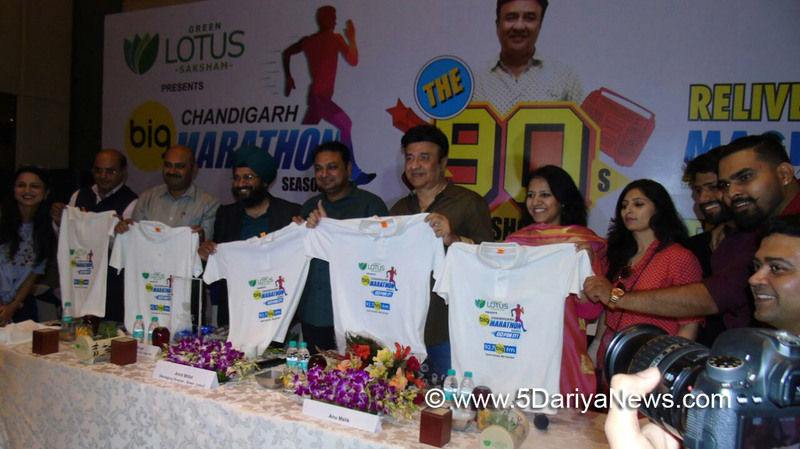 92.7 BIG FM, one of India’s largest radio networks, is all set to host “BIG Chandigarh Marathon Season 6", a mega sports event scheduled to be held on 1st April 2018. The theme based marathon this year will promote the message of making Chandigarh a better place to live in with “Go For It. Run for a better future”. The radio station will build conversations around suggestive measures that should be taken up by the citizens to contribute towards developing Chandigarh. Ace Bollywood music director and host of BIG FM’s ‘90s show with Anu Malik’, Anu Malik and local authorities announced the marathon by unveiling the jersey today.Anu Malik the host of ‘The 90s Show with Anu Malik - as the name suggests, takes listeners back in time when story-telling, music and stardom ruled Bollywood. The ace composer and ever versatile Anu Malik engages listeners with trendsetting songs and film trivia from the 90s and early millennium from Mon- Fri, 8pm to 10pm across markets. The BIG Chandigarh Marathon will witness local authorities and celebrities come together to discuss with the residents the practices that can prepare the city towards a better future and contribute in making it a smart city. The marathon starting from Chandigarh Club Ground will be divided into two parts - one for General Public 5km Fun Run and a Half Marathon of 21 Kms for professional runners. Registrations are open for on the microsite www.bigchandigarhmarathon.com. 5 Kms Fun run is open for all and interested participants can register by giving a missed call on Toll Free number 1800 137 1927.5 Kilometer Fun Run will be a run for a cause promoting the message of ‘Run for a better future’, and every kilometre in this run will be dedicated to a cause like Run For Fitness, Run For Safety, Run For Cleanliness, Run For Environment which are paramount in Tri-City and affect the society at large. The prize money amounting up to Rs 2.4 lacs will be awarded to the winners in different categories under the 21 Kms Half Marathon.